"Les bois flottés de Sophie" is a site entirely dedicated to the driftwood. You will find on this site: photos, tips, videos, info on this timeless material. You will discover in our online store all the driftwood to create: driftwood batches, trunks, strains, planks, unique driftwood, etc. Many natural elements are also available: shells, pebbles, bark, vines, etc. For more than 15 years, we collaborate with many professionals: interior designers, decorators, advertising and event professionals, landscapers, etc. We accompany them in their projects by providing them advice and solutions. ￼ I am satisfied with my purchases at this trader of net. His products gave to me satisfaction. With the various batches which I acquired, I made numerous objects. The smell of the sea reminds me a lot of memories... Thank you. ￼ That smells well the sea and the sun! I realized my lamps with this small driftwood and powder of stone. The result is widely equal even better than we can find at the big creator's. Thank you. ￼ Your driftwood is magic! I close eyes, I feel your wood and I travel... I hope that my creations will make so much effect... Thank you. ￼ Everything was well received. My driftwood allowed me to make 4 lamps. Thank you for the information. See you soon. ￼ Speed OK, products OK, quality OK. 3 +. I recommend this shop. Beautiful mixture of driftwood from sea. Realization of a coffee table with several levels. Quality and seriousness. Help and advice. Thank you. So continue. With your trunks and your advice, I realized 2 ends of sofa with big ease. My ends of sofas are even more beautiful than those whom we can find on sale! I am really very satisfied. I RECOMMEND!!! I discover driftwood with this first order and I remain open-mouthed! In Belgium we don't have the luck to have the Mediterranean Sea... I recommend your shop with most great pleasure. Thank you very much for your reactivity. This type of driftwood was of used into the realization of frame for photos-frames and as a supplement to the thick driftwood for the realization of lamps. Great site! We were able to realize our photos shootings in time. Happy to have met you.. Thank you very much for your reactivity. For 4 years, always so much pleasure to order your driftwood. Wonders from nature and products of exception. I am delighted by my new purchases. Creation of a folding screen of charm. I am delighted by my order. Branches are perfected. I have created a small separation between my dining room and my lounge and the result is magnificent. I recommend with great pleasure this type of products but also your site. 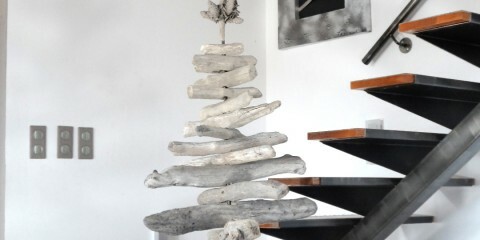 On this site you will find a diversity of driftwood that will bring you inspiration for your future creations. Nouveau site – Les bois flottés de SophieNous sommes ravis de vous annoncer la mise en ligne de notre nouveau site internet Les bois flottés de Sophie. Venez découvrir notre nouveau design, nos services, nos actualités et ..
Sapin de Noël en bois flottéSapin en bois flotté fait rimer Noël avec originalité et respect de la nature. Aussi belles que durables, ces étonnantes créations en bois flotté feront souffler un vent de poésie ..
A soul of artist maybe inside you... Dare create! 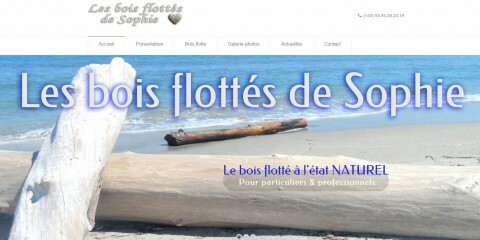 "Les bois flottés de Sophie", leading provider of driftwood and other natural elements in France and Europe.